THE first greeting traditionally offered in Japan on New Year’s Day is Akemashite, o-medeto gozaimasu. So, akemashite, y’all! And Happy New Year! A certain media outlet asked me to review some book about the South Korean presidential election. When I asked them if I could choose the book to review, they told me to choose whichever book I liked from my perspective. When I asked them if they would accept a book with a slanted viewpoint, they said that would be fine. I accepted the job on those terms. But then they told me I couldn’t use the book I selected. Floats at the Sakurayama Hachiman-gu fall festival in Toyama, Gifu. South Korean historical scholar Cheong Jae-jeong’s statement that Takeshima is the same as Mt. Fuji for the South Korean people is absurd. The intellectuals and the mass media give their full support to the government’s propaganda that small islets which had no meaning for them 60 years ago are now the symbol of the race. Cheong is affiliated with the Korean Northeast Asian History Foundation, which is a propaganda organ. It would be pointless to conduct joint historical research with them. The 21st Kagura Festival in Aso, Kumamoto. 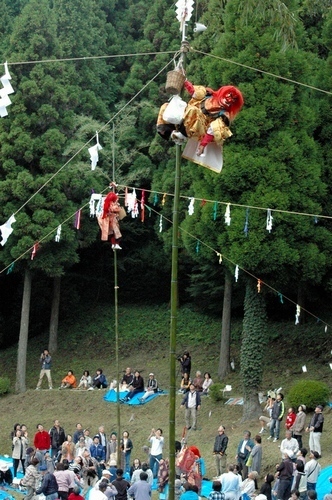 The festival brings together different styles of Shinto kagura dance from around the country. This year 10 groups participated. 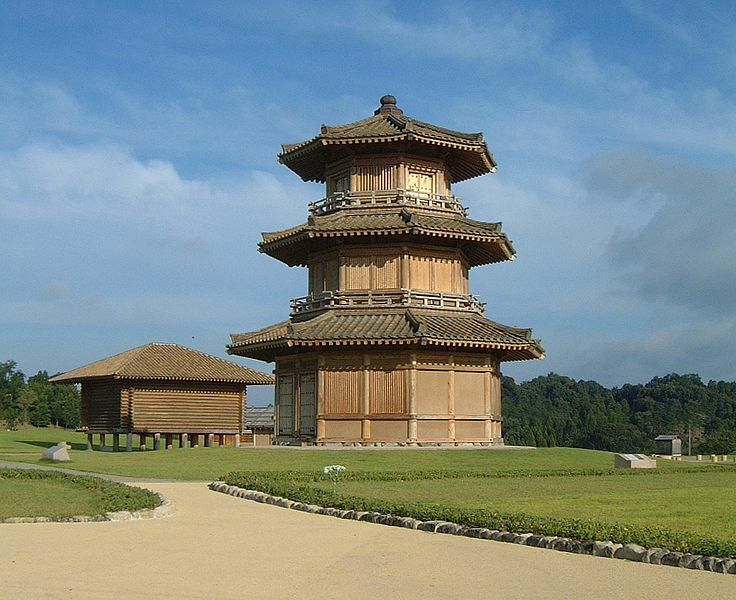 Kukuchi-jo, a (perhaps) Korean-style fortress, now a national historical structure in a national park in Yamaga, Kumamoto. It is not known when it was built, but the name first appears in written records in 698. Here’s the Japanese-language website. Whenever the Emperor is brought up, the Japanese dispense with reason and lose their capacity for judgment. The Japan that existed before the Second World War again shows its face. It’s the same with the Japanese government and their attitude that they can’t let anyone say one word about the Emperor. That portion of the elite capable of performing a role globally will in the future become detached from most of the low income group. Opinions on whether this type of society should be permitted are probably divided. But the age in which people called for prosperity for everyone is over. 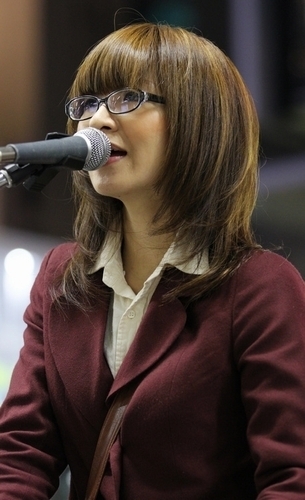 Author and columnist Tachibana Akira wrote an article published in the Weekly Purieibooi earlier this year whose intent was to keep the interest in the period grounded in reality. The title of his article was, If you want to learn about life in the Edo period, go to a slum in India. Here it is in English. You sometimes hear people frustrated with the lack of growth in the Japanese economy say they would like to return to the ordered society of the Edo period. They seem to think that life was by far more humane in pre-modern society than today’s free market-based society. Researchers in the new academic discipline of historical demography are studying past population trends using records of the population registers called shumon aratamecho and ninbetsu aratamecho. What can we learn about daily life in the Edo period studying the movement of people and changes in the population? The historians have discovered some strange phenomena as a result. While the population increased in most regions during the Edo period, they declined in the (highly populated) Kanto and Kinki regions. These two regions contained the cities of Edo (Tokyo), Osaka, and Kyoto, which had more than one million people each. Why did the population grow in regional areas and fall in the cities? It’s because living conditions in those cities at the time were foul. Other than those instances in which their farmland was expanded through reclamation or other projects, all but the eldest sons of farm households went elsewhere to seek work. Most of them left home at age 14-15 to become apprentices. It was common to take up such work as the weavers of Nishin brocade or to become attached to commercial establishments. The apprentices lived packed into the back rooms under the roof in commercial establishments. They became particularly susceptible to infectious diseases. Extensive harm was unavoidable if there was an outbreak of smallpox or dysentery. While the infant mortality rate was high during the Edo period, it was not unusual for people in agricultural villages to live into their 60s. In the three largest cities, however, deaths from malnutrition or infectious disease in one’s teens or twenties were a frequent occurrence. The population of Japan in the ordered society of the Edo period remained constant at roughly 26 million. This was not because of the stability of society, however, but because the population increases in the farming villages were weeded out in the cities. Edo, Kyoto, and Osaka were death traps for the young people who went there to find work. The poor from outlying regions who came to Edo found employment as construction laborers, peddlers, or menials at commercial establishments. If they were thrown out of work, it is likely they had few options other than begging or prostitution to survive. Conditions in impoverished countries are very similar. That poverty also existed in the Edo period, and many people had no choice other than to live in nagaya in the slum districts. You don’t need a time machine to experience life in the Edo period. All you have to do is go to a South Asian slum. Mr. Tachibana’s Japanese-language website has an English title: Stairway to Heaven. It features a photograph of the ladders to heaven painted on the side of a mountain near the sacred Yamdrok Lake in Tibet. Twelfth-century warlord Taira no Kiyomori worshipped at the Kamo Shinto shrine in Tatsuno, Hyogo. 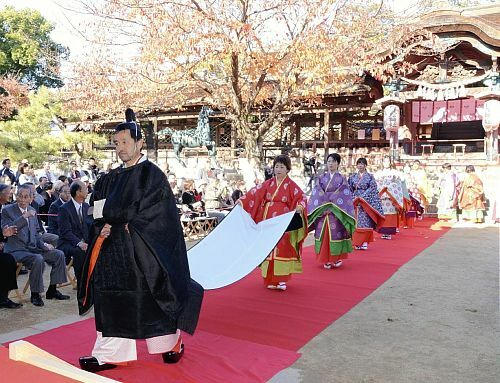 The shrine recreates in period costume a procession with Kiyomori and his wife Tokiko. I do not repudiate either the “post-nation state” or regional devolution. It might be that the bright future for mankind is a borderless aggregation of free individuals. But that is a world of self-responsibility requiring extreme self-sufficiency with considerable costs. It is not frivolous behavior that resembles a son having an argument with his father, storming out of the house, and demanding that he keep sending money. DID you get well and truly sloshed over the long weekend that included Christmas Eve and Christmas? The percentage of Japanese slumped face down on the bar or snoring in their easy chairs was probably no larger than it would be for any other weekend, however. Christmas is a working day here, unless it falls on Saturday or Sunday. Besides, not everyone in this part of the world behaves badly when they redline on liquor. In fact, there’s a certain tradition of drunken elegance that’s been turned into a religious ritual and dance. It’s called the konju, which originated as an imitation of the movements of some Chinese guy in ancient times who got a snootful and started rambling. It arrived in Japan in 736, but doesn’t survive in its original form. That’s because it was modified during the reign of the Emperor Ninmyo, which places it somewhere in the early to mid-Eighth Century. The dance is so elegant, in fact, it’s often performed at Shinto ceremonies throughout Japan. 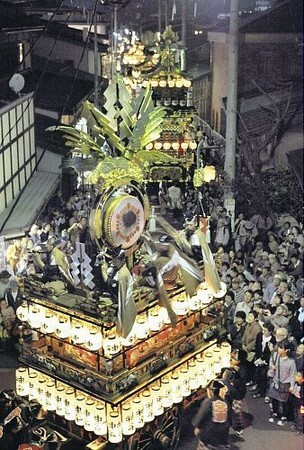 One example was its presentation at the Bugaku festival of the Hodaka Shinto shrine in Matsumoto, Nagano. The folks at the Hodaka shrine thought it would be fun to couple a traditional dance festival with their Daisengu Festival, which rolls around once every 20 years. The konju was part of the choreography. The performance was held at a site just as elegant for its beauty. The backdrop was the 3,190-meter-high Mt. Okuhodaka in the Japanese Alps. The stage was placed next to a bridge and a pond. Come clean, now — that’s not how you behaved at the office Christmas party, was it? Here’s a performance of the dance at a different time and different place. He does look a bit ripped, doesn’t he? 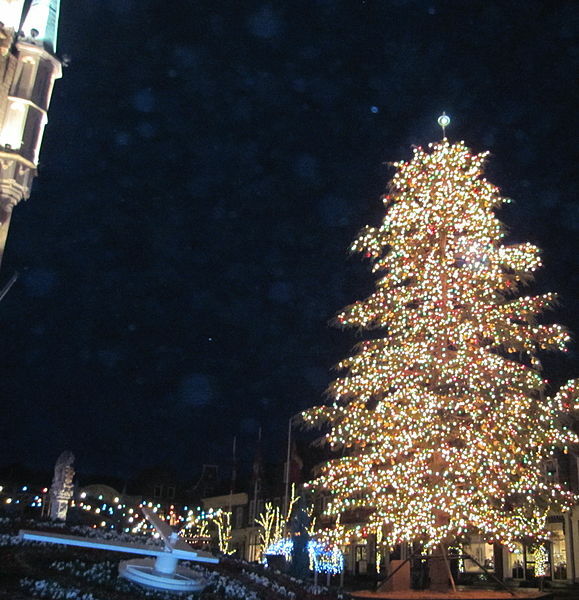 The Christmas tree at Huis ten Bosch, a theme park in Sasebo, Nagasaki, that recreates The Netherlands with full-scale copies of old Dutch buildings. 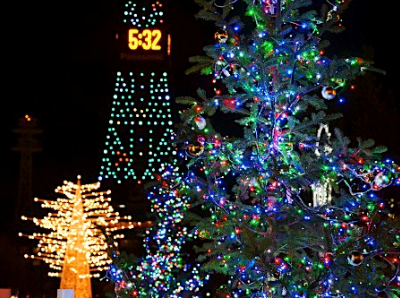 Christmas in Japan is a festival of light. For even more creative examples, hit the tag at the bottom of the post. Merry Christmas to Mr. Lawrence, and to you all!